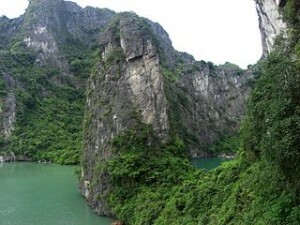 When you would go to Halong Bay from Hanoi, travelers will surely pass Halong City. Glance it appears that this city is the opposite of Halong bay. Unlike in some other countries where the seaside town becomes interesting attractions, Halong City feels there is no privilege. Overview you will see a large hotel with no character. Shop with dusty streets. But make no mistake, this city is the heart of community life Halong Bay as well as the supporting infrastructure for the development of tourism. Most tourists just passing through the city in passing as part of a tour that starts and ends in Hanoi. There are also tourists who choose to stay in this town, but usually only lasted two days. However, reportedly surviving Halong City of domestic tourist visits, as well as the company held an event at a large hotel in this area. many Chinese tourists who love to come to Halong City before. However, for some reason since a few years ago the number of tourist arrivals plummeted neighboring countries. The decrease in the number of Chinese tourists has resulted in the bankruptcy of many hotels in Halong City. Halong City is the capital of the province of Quang Ninh. Broadly speaking, the city is divided into two parts, namely Hon Gai and Bai Chay is connected by a bridge. Bai Chay is a resort town as part of Halong City while Hon Gai is more like the countryside. Bai Chay is filled with hotels and restaurants, as well as the dock where the boat tour of Halong Bay framed. Here also there is a small beach, not good enough when compared to the beaches in Halong Bay. One type of accommodation is a fairly large luxury hotel. The advantages of this kind of hotel is a tall building that offers a beautiful view of Halong Bay from a distance. Of course this type of hotel would not be suitable for a backpacker. If you are a backpacker travelers who intend to stay in Halong City, you can choose the some mini-hotel which is located in the vicinity of Vuon Dao street. On the day of the festival, this hotel met by domestic visitors. But in addition to these days, mostly empty or closed trap. Many hotels that make them the ground floor as a shop that sells a variety of objects. There are also many mini-hotels that rent rooms by the hour with special offers massages. When you decide to stay at Halong City, you can go to Vuon Dao Street along the alley in the vicinity. In the vicinity of this place are very much a mini hotel. The size of the accommodation is almost identical, with a face width of only about 4 feet, but reach up to six floors. Some have a lift, but most only provide a ladder. Most provide a room with a fan and private bathroom. If you visit in the off-season, don’t forget to bargain. Typically the rooms at high floor will be sold cheaper than at the lower floor. In addition to saving the budget, you can workout at the same time. Some of the following options according to the backpacker with a room rate of less than $ 10 for each person. Peace Hoa Binh Hotel is located at 39 Vuon Dao, Bai Chay. This hotel is one of the favorites of tourists staying in Halong City. In the holiday season, the price per room is higher than usual. The two main advantages of this hotel is the lower part functions as internet cafes and Peace Hotel is also one of the few hotels that accept payment by credit card. In addition, some hotels which a recommendation is Holiday Hotel, Thuy Duong Hotel, and Mai Hoa Hotel. The hospital is located approximately 5 km to the west pier. However, there is one more hospital in Hon Gai. Vietcombank ATMs can be found in approximately one kilometer to the left of the pier. ATMs are accessible 24 hours. There is another ATM is connected only with the Chinese bank. Currency exchange can be found next to the dock, but usually the exchange rate which they offer is very detrimental. There’s good money to exchange travelers with local currency in Hanoi or other cities. post office is located at the end of Vuon Dao Street near the intersection of Halong. Here you can make international calls. Internet is pretty much available around Halong City with a variety of prices. Some mini-hotel as Peace Hotel also provides internet cafe. The police station is located about 2 kilometers from the city. Police Station in Halong City is very small and located next to the Hai Yen Hotel.